Today was a slow day, and I actually had quite a bit of time to myself coupled with not a lot of energy. It was hot outside, the daughter took two long naps and the husband worked through lunch. So, today was a perfect day to cross off “Finish a book” from the list. 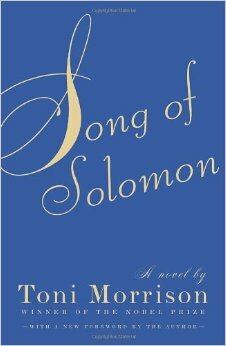 I finished “Song of Solomon” by Toni Morrison, which I had started several months ago and simply got distracted before I could finish. I don’t know if I could label Toni Morrison’s writing as “enjoyable” for the sake of being pleasant, but she forces her readers to really dig down deep and come face-to-face with scenarios that we’d often rather ignore. For that, I find her writing enjoyable for the sake of making me feel something and forcing the wheels in my mind to turn. However, if you want some lighter reading or simply want to stick with the pregnancy/self-improvement mode, I really enjoyed “What to Expect When You’re Expecting” during my first pregnancy and “The Happiness Project” just a few months ago. Both were great reads; they’re educational and motivational. Great idea to have a list as a countdown!! I actually have been watching my email for something from her but haven’t received anything (I checked spam too, but it’s always possible something was overlooked). I was about to ask you if I should go ahead and contact her, so thanks for letting me know! I just messaged her on Etsy. And thanks, about the countdown list! I figured it was much less overwhelming to make a list and do one item a day versus chaotically trying to get it all done at once. Let me know if you have to-do suggestions beforehand that were helpful for you :).